49 states with snow, 1180 new snowfall records set in the USA this past week – is February Headed For Record Snowfall? | Watts Up With That? 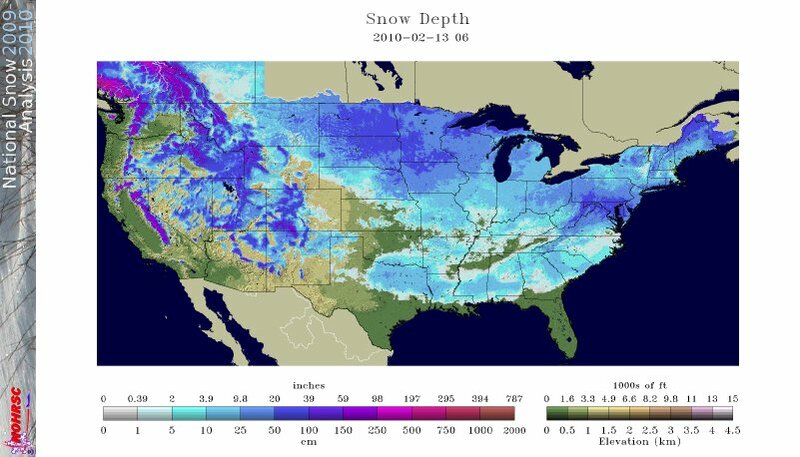 49 states with snow, 1180 new snowfall records set in the USA this past week – is February Headed For Record Snowfall? Continuing the pattern of top ten Northern Hemisphere snow extent rankings from October, December and January, it looks like February may also be headed for the record books. North America, Europe and Asia are all showing large positive anomalies in snow cover. The record February snow extent occurred in 1978 with an anomaly of more than 5 million square miles. That may be tough to beat, but from the map above it may have already happened. February will definitely be ranked in the top two. Ten years ago we were told that “Snowfalls are now just a thing of the past” Alarmists are now attempting to rewrite history and claim that they predicted record snow and cold all along – but it simply isn’t true. Everyone from Hansen on down was predicting the demise of snow in the temperate zones, until they realized they were wrong. “People should know when they are conquered.” – Quintus from the movie Gladiator. h/t to Steve Goddard for the story idea and several content links. 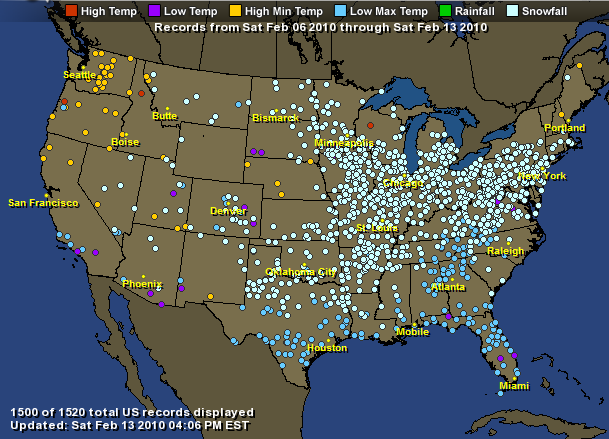 February 13, 2010 in records, snowfall, Weather. After adjustments it will be the warmest on record. You should remember that this is not ordinary real snow this is rotten snow. For AGW’s it doesn’t exist in the real snow world. So they were right. We saw rotten snow last year as well beating lots of records but only for rotten snow. Then perhaps we should be less sqeamish about the people who won’t learn. Perhaps we should pursue them to gaol. Global warming frozen to death ? If snow is a thing of the past, and more snow is due to global warming, which is it?? The warming people can’t have it both ways. And…I don’t see from my perspective that there has been any increase in global temperature average during the past 100 years….My question is, are the warmists just making this stuff up as they go along, or are have they gone to Bhagdad Bob University, and don’t know what is real any more and are beginning to believe their own lies? Here, just west of Charlotte, NC, we had about 3″-4″ of global warming last night. It REALLY warmed all over central SC last night. 6″-8″ from Columbia to Charleston, which had thunder-warming last night. Probably first time since the LIA they had that…. Global warming is so powerful, there is nothing it cant do. Hot or cold, snow or lack of it. The only way to stop the climate from changing is to buy carbon offsets from Al Gore. Listen here you lazy ball of fusion. You’ve been resting long enough. It’s freaking cold and snowy. Please come back to life. And only 1 year ago NOAA, Joe Romm and others tells us droughts in the southwest will prevail. And misguided Romm says dustbowls are permanent. 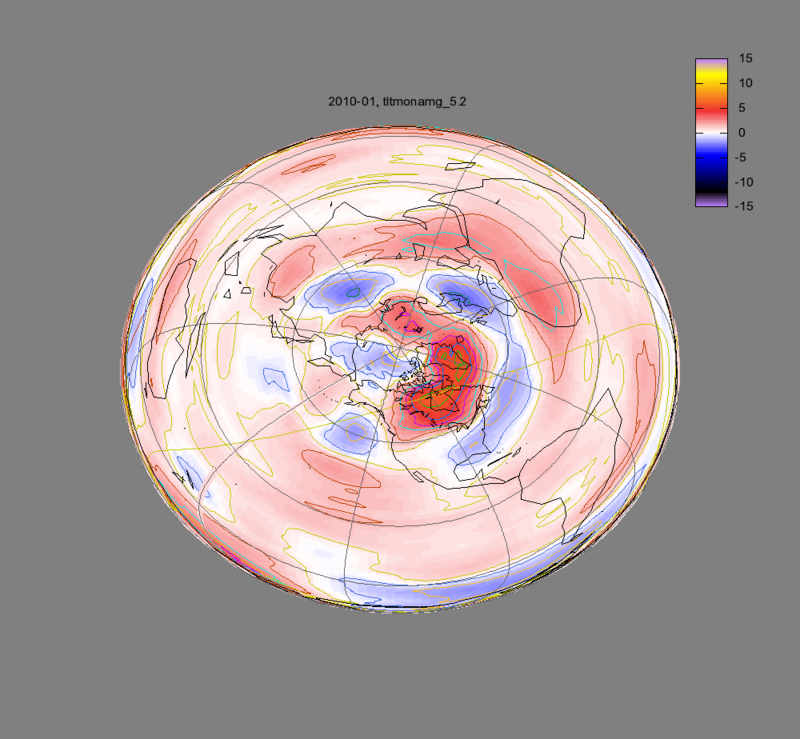 Why the blanket Nino Climatology graphic? Yes, the subtropical jet has made itself prevelant. But, Nino’s during -PDO cycles are much different then we have seen in the 80’s/90’s during +PDO phase……. The audacity of the travesty, is worse than we thought. On a scale of 1 to 10, how strong would this El Nino Year be rated as compared to the previous El Nino years? Does rotten snow mixed with dustbowl give you artificial fudge sickles? With NOAA’s systematic removal of high latitude weather data from the record it will be interesting to see their next anomaly map. I may just be the smoking gun they shoot themselves in the foot with. Arrgh. Beat me to it. Doesn’t Hawaii have a seasonal snow cap on Mauna Kea? Stephen Foster wrote the original Oh Susanna lyrics in 1847. The most severe snow storm that I can recall was the blizzard of ’69. Traveling on route 13 in upstate NY, we had to turn our vehicle around when we came across a giant county snowplow stuck in the snow. The second worst blizzard that I experienced was in 1978. Yes, we had those whiteish “global warming” events in the 1960’s and 1970’s too, but back then who would have suspected such, after all, the AGW alarmists were still in their incubators, waiting to hatch. Actually I have my own theory: the theory of CodeTech’s car. In 1987 I bought a shiny new Daytona Shelby Z. Every time I washed it, we had precipitation within 24 hours. To test my theory, I would leave it for a few days. No precipitation. Then I’d wash and wax it, and boom: rain, thunderstorm, freezing rain, snow, whatever it took to get it dirty again, within 24 hours. I felt like a God… in control of the weather, I could cause drought just by deciding to leave my car dirty. With apologies to everyone, I bought a new Caliber SRT4 in late August 2009. Again, I have discovered that I am in control. And for the record, I have washed it every day that it needed washing. In response, the weather has cooperated well. Aah, this must be from the ever-so-ironically-named “weather is not climate” department. My favorite. There seems to be a deep misunderstanding about global climate change on this thread (and this website, for that matter). I know of no AGW climate scientist that predicted the effects of climate change would be uniform across the globe. Some places may get hotter; some places may get cooler. Some places may get wetter; some places may get drier. Some places may get more snow; some places may get less snow. Get it? I would also point out that January 2010 was the warmest January in 32 years. One should expect a great deal of moisture to be hanging around the atmosphere, as that correlates positively with temperature. Why are we so surprised about heavy snowfall in winter, when temperatures are cold? Lots of moisture + cold temperatures = snow. Right? Wake me up when someobody post something here that isn’t an utter waste of time. Is it possible to calculate/estimate the delta-albedo effect? The reflected IR radiation from soil and vegetation, that is allegedly “captured” by CO2 thereby causing alleged warming, cannot be of the same quantities as when reflected off snow. The problem with your theory is that all these events are not unique, they have all occurred throughout history. Wake me up when someobody post [sic] something here that isn’t an utter waste of time. 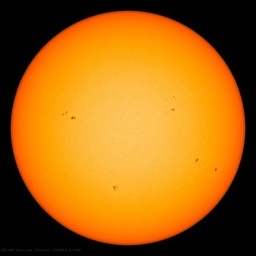 The Sun actually is waking up, it’s just most of the sunspots in the past several days have rotated out of view now. The fact that we’re no longer seeing days with no spots on the Sun shows that Solar Cycle 24 is showing at least a minimal amount of progress. I wonder the same thing. Are the recent very large anomalies in the LT from satellite data for January influenced by the amount of snow cover? And that is why AGW theory is ridiculous. Some places MAY blah blah blah, some places MAY blech blech blech and some places MAY bing bing bing. AGW predicts nothing that can be pinned down. Pretty slick, if you are a snake oil salesman. In February, 1899, ice floes in Gulf of Mexico; snowstorms from FL to ME with 30 to 40 inches of snow in VA. It is the storm of the century according to the Weather Channel. Between February 1 and 14, 1899, a cold wave caused a massive East Coast blizzard and induced bitter cold temperatures across two-thirds of the Nation, from the Rockies to the Atlantic Ocean. “In a sense this is probably the first and only time true blizzard conditions existed in the state of Florida. In fact, Florida probably experienced their only blizzard in history with this particular storm,” says Paul Kocin. All that snow everywhere but here in Vancouver. Amazing how AGW is so selective. There seems to be a deep misunderstanding about global climate change on this thread (and this website, for that matter). …Some places may get hotter; some places may get cooler. Some places may get wetter; some places may get drier. Some places may get more snow; some places may get less snow. Get it? In short, climate change (due to manmade C02, of course) causes everything. No matter what happens, it’s our fault. The theory of manmade climate change is non-falsifiable. Got it. Wait – isn’t that religion? Some places may get hotter; some places may get cooler. Some places may get wetter; some places may get drier. Some places may get more snow; some places may get less snow. Get it? You modified a song by Jefferson Airplane. Got it. Almost impossible to have the biggest, hottest, anything ever! now. Nino’s gone neutral by April…. Only 49 States with snow? Honolulu and Maui isn’t all of Hawaii. Are Mauna Loa and Mauna Kea on the Big island snow free this year? The best humor is ironic. Global Warming: The Wooly Mammoth of Climate, found frozen stiff with a mouthful of Hockey Stick flowers. Yes, you see, it’s quite elementary. If you have 10x the cold snowy anomalies as you do warm dry anomalies, it’s Global Cooling. I.E. – AGW ran out of hot air. No need for a massive dissertation on petaflopping GCM’s. Now, was that so hard to understand? The world-wide temperature records, including the sat data, showing a degree of warming unprecedented in the last 2,000 years. The warming is easily sufficient to reject the null hypothesis (the globe is not warming) and supported by many independent lines of evidence. You can certainly falsify AGW, just not with weather events entirely consistent with the predictions of the theory. I feel (*shovel, shovel, shovel*) your pain, (*shovel, shovel, shovel*), Ray (*shovel, shovel, gasp*). Sat data from the last 2000 nyrs..
It’s astonising how just as soon as another AGW bonfire is lit, NGC moves in and dumps a bowl of cold snowflakes all over it. I live on the Canadian border, and about 45 degrees North, and it looks to us like winter went south for the winter. It has been pretty normal, highs in the twenties every day lately, lows in the teens. Spring is in the air. It has been a couple weeks since I wore pajama bottoms under my pants to keep warm. You know what killed the woolly mammoths? Climate change caused by their flatulence. This snow path is absolutely facinating! In looking at how an Ice Age would work, one would assume the precipataion line would be all across the northern hemisphere at one causing the thickness. But if going from south cold and working north would keep the cycle of cold air in play to intermix with warm creating mass precipitation the would invade thicker nothward. How does satellite data show a degree of warming unprecedented in the past 2000 years? I’m dying to see that data set! Wow, talk about doubling down in the face of long odds! Now it is warmer today, not just than the Medieval Warm Period, but warmer than the Roman Warm Period when Hannibal crossed the Alps with elephants. I would start a debate, but it just doesn’t seem like it would be all that productive in this case. Is there such a word as “climate irredentism? One day my son, you will understand that unless the sun has an alarm clock for every Ice Age to occur on time, then, you will realize that it is the pressure build-up of your own planet that has set into motion the massive reflectors to sunlight to be opened…Salt crystals and snow. Lotta silly trollobytes [sic] tonight… The first north pole view I think is pretty meaningless, and probably inaccurate, based on where I sit, but the second one is interesting – it would appear that the reported anomaly is all situated on the same global latitudinal band. This leads me to conjecture that this is, of course, the lower latitudinal limit of arctic cold air flow, perhaps due to decreased solar activity. Since this cold air is more likely to produce snow out the more humid and deeper moist atsmosphere of tropics and subtropics, the pattern is not surprising. Its further fun to speculate that since we have this apparent propensity to produce lots of heavy snow out of all of this moist subtrop and tropical air, that here is where the ice ages start, if the sun co-operates. At some point there may be a tipping point (eep, did I just say that?) where if the amount of snow falling in these latitudinal belts becomes sufficiently frequent to actually begin to have sufficient albedo effects etc. to enhance the persistence of cold air over these latitudes, eureka! glaciers. Hey, It’s Saturday night and there’s nothing much good on TV. I had no idea snow was a function of colder then average temps. Warmer temps produce more moisture and in the winter that falls as snow. On another forum http://www.freerepublic.com that point was brought and a writer from HI reported that they are in a drought (low precipitation) cycle, and that (contrary to what I expected) the tops of their volcanoes are very cold, but ice free right now. You’re right, usually, both volcanoes on the big island are ice-covered. i have no other confirmation of they’re being ice-free other than his report. The rain and even snow flurries rained out qualifying and practice at Daytona Beach friday. Maybe that’s why she crashed on lap 68? Or was she fixing her makeup? Forgot to go to the bathroom before the race? This for Jan may add insight. This is a work in progress and the image is wrong, I know. Lots of moisture + global warming = rain. No apologies necessary for wanting a car that’s a blast to drive. Life’s too short to drive a Prius unless you are a high mileage guy. I like to cut loose with my 300C sometimes, all 5.7 litres of bellowing V8. Convert some fossil fuel back into plant food. The figure above shows the tongue of warmth extending into Southern Ontario but I have observed the temperatures to be steadily a few degrees below average at the London Airport. No exceptionally low temperatures, just steadily below average. We also have had below normal snow fall here, probably because the storm tracks are shifted south due to the AO being so negative. Maybe Danica couldn’t figure out if she was racey or a racer. I do wish her well, however. 🙂 You go, girl! Thought that might warm you fellows up! Wanta bet that no races get snowed out? Climate scientists over the last years have tortured, manipulated and cherry picked climate data until it confessed to the AGW theory. If scientists would have used the data they had on hand to identify climate cycles such as the PDO and El Nino events could they have been able to better predict unfolding weather pattern similar to what we have see in the 70th and inform communities and the public well in advance to prepare? You can ball park the difference using well known rules of thumb intended for photographers to estimate exposures for photographs. A standard assumption in photography is that a “typical scene” is approximated by an 18% reflectance gray card. That implies that normally vegitated terrain absorbs approximately 82% of the suns light, and reflects 18%. In the Zone system of photography popularized by Ansul Adams, each “zone” represents one F-stop of exposure which is by definition a doubling of the light intensity. The 18% reflectance gray card represents Zone 5 exposure and Zone 8 represents brilliant white surfaces like a snow field in flat sunlight, and clean white paint. Zone 9 represents specular reflections such as direct reflection off of snow or a glint of a specular reflection of the sun off of Chrome or similar reflective surface. Those relationships imply that clean white snow has a brightness of at least 3 F-stops (2x2x2 = 8). Eight times the brightness of typical terrain would mean that clean white snow absorbs approximately 10.5% of the suns visible light (photographic film is sensitive to), compared to typical terrains absorption of about 82%. Ball park, typical terrain reflects 18% of the light, clean new snow reflects approximately 90% of the light it is exposed to. Waste of time, eh? Rather like your drivel? Point is, we do understand that it’s just weather. Unlike you clowns, we have a sense of humor. Why not go back and hang with your friends at RC? Oh, sorry, they ain’t posting much lately are they. So you must be lonely. Must be because the pseudo-science is settled. Although the “White Mountain” does often have winter snow (and skiing – no chair lift, just the road which is sometimes closed due to snow/ice/wind) there currently is none. Temp at 7am today (Sat., 2/13) was 32F with 5% RH and the outlook is for dry, stable conditions to continue. Too bad, could’ve been 50 out of 50. Has anyone noticed that the Oceans have not gained or lost water? The plates that separated our land masses are not distored. If there was rise or fall of the oceans since the beginning then the edges of our land masses would have growth distortions or submersion distortions. Anyway… Well, I forgot what I was orginally going to say! That would be something to see: Danica reeling in/running down Gore at the NASCAR track. The purse would surely go out the window…snow or no snow. just one question, how does Hawaii get snow? You are misstating the null hypothesis. The null hypothesis is that the warming is within natural variability. But gee what do we expect? There is no empirical evidence demonstrating that the current warm period is man-made. Nor is there any evidence that it is warmer than the Roman Warm Period, the Medieval Warm Period or the Holocene Optimum; all which were warmer than today and absent of man-made CO2. Simply repeating the mantra is a non-starter. Your ship is holed and sinking and has been demonstrated to be a fraud. We’re still waiting for the data, code, and methodology which your co-religionists are afraid to expose to the light of day. If i understand you correctly there is absolutely no reason why anyone should ever have cared for the AGW “hypothesis” in the first place because it makes no prediction at all. Good points. I’ve been mulling over the albedo-effect myself. One thing that has occurred to me is that, even though all the reflected light represents a net loss to earth’s energy-budget, it likely would warm the troposphere on its way out. Therefore a blip of temporary warming might be seen in satellite data, even as cooling occurs. A second factor which might enhance the temporary blip in temperature data is the simple fact enormous amounts of latent heat is released from water vapor when it changes its state to liquid and then solid, in the blizzards which create the expanded snow cover. This released heat is sucked back up again as the snow is melted, and it again becomes latent, but as long as the snow cover exists the released heat is free to float about and make temperatures appear higher. In conclusion, if one only looks at temperatures in the troposphere one may over-focus on a blip, and miss the big picture. >>winter that falls as snow. Errrm, the average winter temperature in the UK is about 4oc. Difficult to get settled snow in the UK with an average temp of 4oc. Perforce, to get settled snow you need a degree of cooling below average, which is exactly what has happened in NW Europe this year. >>you are a high mileage guy. I do so hate this pious Prius guff, that is all over the media. The Greenest of these two vehicles is the Citroen diesel. Thus anyone buying a Prius is a pious idiot who is out to destroy the environment with their gas-guzzeler, and polluting the environment with all those heavy metals in the battery-pack. The winter of 1780 in the US saw massive snow cover and it was also an El Nino year. The following hurricane season wiped out the international fleets in the West Indies. Shouldn’t someone be raising a ‘concern flag’? Want to see if there is any snow on Hawaii’s volcanoes today? Hawaii is towards the bottom of the page. Surely there’s some snow atop Mauna Loa? First, that’s a straw man, as no one claims these types of weather events in themselves falsify AGW, although they certainly do call it into question, especially since these cold-weather events have been increasing both in number and severity in recent years. With warming, one would certainly expect the opposite. Secondly, your claim that these events are “entirely consistent with the predictions of the theory” proves my point. If AGW theory “predicts” any and all manner of weather events, including wet, dry, hot or cold it turns it into a type of quasi-religion. The fact remains that AGW/CC theory is non-falsifiable. It is ideology dressed up as science. Your statement does not include the possibility that the latent heat of fusion is promptly radiated away to space at the cloud tops. Convective lift of moisture and freeze outs significantly warms the cloud tops compared to the dry air temperatures at the same altitude. This is a mechanical process that effectively bypasses the tropospheric heat transport by radiation which would be effected by CO2, and instead pumps heat to high altitudes mechanically. It is a natural heat pump that moves enormous amounts of heat using water vapor, liquid and crystal ice as the working fluid. By comparison CO2’s effect on IR radiation at those altitudes is totally irrelevant, its effect is totally swamped by the latent heat of condensation, and latent heat of fusion energy release as the water vapor is lifted above the local condensation level and the local freezing level. At each change in state more heat is released changing latent heat to sensible heat that can be radiated away at the tropopause/cloud tops. …Convective lift of moisture and freeze outs significantly warms the cloud tops compared to the dry air temperatures at the same altitude. This is a mechanical process that effectively bypasses the tropospheric heat transport by radiation which would be effected by CO2, and instead pumps heat to high altitudes mechanically. It is a natural heat pump that moves enormous amounts of heat using water vapor, liquid and crystal ice as the working fluid. By comparison CO2’s effect on IR radiation at those altitudes is totally irrelevant, its effect is totally swamped by the latent heat of condensation, and latent heat of fusion energy release as the water vapor is lifted above the local condensation level and the local freezing level. At each change in state more heat is released changing latent heat to sensible heat that can be radiated away at the tropopause/cloud tops. I feel pretty certain that reasonable people who rely on logic rather than politics and main stream journalism, would avoid recognizing any single weather event, or season, as proving or disproving global warming. I don’t care which side of the debate you’re on, As soon as this hypothesis became infected with politicians and political talk shows, logic, reason, and science began to atrophy. I also feel that it’s become a very Northern Hemisphere centered topic. On that other planet, the one not called EuroAsiaAmerica, the one with South America, Africa, and all the other continents South of the Equator, the one we only hear about in war, famine, and history, that planet, called the Southern Hemisphere, is having record high temperatures while the US is having record snow fall and a cold winter in many states. Unfortunately most people seem fixated on what’s happening where they live. It’s well known, basic climate science that when the jet stream drops we get cold weather in the US (it’s also pretty easy to understand that those drops would naturally bring Arctic air South). We know, based on observations, that the ice is melting off of Greenland (contrary to what Rush L. stated, Greenland has been ice covered since the Vikings named it that to distract people from the very green and lush Iceland). It’s also common knowledge that lake and ocean water turn over, bottom to top, throughout the year, bringing the cold water to the surface. Most of us also know that salt water is denser than cold water. It looks like we have a layer of fresh water growing in the Northern Atlantic, which means the much colder, bottom water never reaches the surface, instead it stays at the salt/fresh barrier, making the ocean surface temperatures warmer. Guess what that does to the jet stream? I makes it drop. Look at where it is when it’s cold in the mid to lower states. People are sooooo easily manipulated by political garbage that they rarely do real research, it’s much, much too difficult for their oversized brains. It seems to me that Western culture has become more about TV sets and popularity contests than thinking and intellecutalism. Our journalists fail us by the minute and are not much different than a coked up super model who can’t stop talking even when they’re not saying anything worth listening to. If you haven’t noticed, our political system has failed us while acting as if they’re protecting us. If you believe in the Democrats or Republicans, I have to assume you just don’t see a better option and have been cornered into supporting the lesser of two very malicious evils. Our “represenatives” are more concerned with their next term than doing their job in the present, and will follow the oil, or global warming money that supports their cushy lifestyle. Journalists are much too concerned with ratings and sales to report on what really matters, to report what’s true, and to report to thinkers rather than followers, which is exactly what our government and advertisers want, and what they’re turning us into. I think we’re on the verge of something special, mass disillusionment, but if we cling to our politics like we do our favorite sports teams and athletes we’ll just be just like little puppies waiting for our masters to tell us what’s true and logical. “Think for yourself, question authority” (T.L. ), heck, question everything I wrote, I like it. Or, become another wasted incarnation of humanity. As humans, the choice is ours. Record snow falls in February 2010. Record snow falls and low temperatures in November 2009. Severest winter in 100 years: 2009/2010. Record low temps in summer 2009. First heavy snowfalls in Rome for 24 years. So the data shows more global warming now then at anytime in the last 2,000 years. But for the only period of time where the tree-ring data can be checked against high quality instruments the two do not agree at all. In fact, they diverge so strong that it’s necessary “to hide the decline” so as not to confuse people. With data like that we are ready to change the basis of industrial civilization right now. May be we’ve all been fooled? that record heat is what is causing the record cold that is killing Peruvian natives who have lived in the Andes for thousands of years – in their summer? Or the unusual summer snowfalls in Australia? Funny how those Norse built their farmsteds underneath the ice sheets a thousand years ago, so that only now are they melting out from under the ice (until the planet started getting cooler 15 years ago, according to the Warmists like Jones) I wonder how they did that, and why they did that? Was under-ice farming something they brought from the Old Country? You write “People are sooooo easily manipulated by political garbage that they rarely do real research, it’s much, much too difficult for their oversized brains.” And you are the poster child for your statement, aren’t you? Thanks for pointing that out. Another blogger pointed out on another thread that the most latent heat is likely released on the very surface of clouds, which would make it more likely the latent heat was lost into space. However I think there might be enough latent heat left over to cause an upward blip in troposphere temperatures. Plenty to go around. The question in my mind is what would be the total, in terms of the world’s energy budget. I think there is an upward peak in troposphere temperatures most winters, which then vanishes after the snow melts in the spring. Perhaps this peak or blip would be larger during winters when the snow cover is especially large. I am just playing around with thoughts, tossing them out there to see how others react. I don’t mind if they are shot full of holes and go down in flames. That’s how I learn. A.) Greenland’s Viking church-yards have hand-dug graves. That soil is now permafrost you’d need a jackhammer of flamethrower to penetrate. B.) Greenland’s Viking fields once were plowed, and grew a variety of crops. They too are now iron-hard permafrost. C.) Other Viking fields grew enough hay to feed livestock. There may even have a brief period at the start when the Greenland colony supported cattle, but soon they shifted to sheep and goats, which they were able to raise for hundred of years (as long as the United States has lasted.) Only at the very end were they reduced to hunting seal, walrus and caribou. D.) The Viking colonies were in the west of Greenland. The east of Greenland is far colder, and grew so cold in the Little Ice Age that even the Dorset Inuet abandoned their settlements. (Interestingly, in those ruins are found a few Norse items, which we don’t know how the Inuet came to possess.) However this same area, in the MWP, was a green coast. This was shown by the recent retreat of a east coast glacier. As the ice retreated it exposed the crushed brush and stumps of birch and other scrub that follows a retreating glacier. It radio-carbon dated from the MWP. In conclusion, the coast of Greenland may have appeared, from a boat at sea, far greener than the coast of Iceland. In the year 1000 the coast of Iceland displayed many cultivated fields, which most of the year would have had a golden color, less green than forests of conifer and birch. This may not be, as you say, “well known, basic climate science,” but it is well known, basic Archeological Science. The idea that Greenland was named “green” as a ruse to attract settlers first appeared in the 1500’s, when the Greenland Vikings were long gone. There is no Viking saga that mentions such a sales-ploy, that I know of. I find it very interesting that the very Climate Scientists who seem guilty of sales-ploys of their own suspect the Viking of sales-ploys, and sieze upon a history written in the 1500’s as proof. Projection? You will likely be reassured to know that our planet’s thermohaline circulation largely is fueled by the melting and refreezing of arctic sea ice, and this melting and refreezing still is occurring. Vast amounts of water continue to sink from sight off the northeast coast of Greenland, to flow very slowly in the deeps, taking hundred of years before it reappears as upwelling along distant coasts as far away as the area north of Japan. It is in fact this vast amount of water leaving the arctic which draws warm surface water into the arctic. In fact the warm phase of the AMO may indicate the thermohaline circulation is more vigorous than usual, and more water departing increases the amount of warm water drawn in. There is no sign that warm climate optimums ever came close to halting this flow, or brought the Gulf Stream to a screeching halt. And if it didn’t happen then, you shouldn’t worry about it happening now. The one time the dire consequences you mention may (in theory) have happened involved a huge freshwater lake, filling the entire Hudson Bay area and covering much land north of the Great Lakes, breaking an ice dam and draining into the ocean in a matter of months or even weeks. You shouldn’t worry about this reoccurring, as no such vast area of fresh water currently exists anywhere on earth. Regarding your worries about nit wits in Washington: I tend to agree with you, but don’t want to touch the subject with a ten foot pole. Rather than Meteorology, that subject seems to involve psychology. Funny thing is, it is also at this site that one can find regular info on the Arctic Oscillation. Local news here in KCMO tonight stated with photos – all 50 states have snow on the ground. They did not give any – ‘last time this happened was’ – statements. I found this to be a Hmmmm for the TV station.